Ear in the Envelope Inc - Metal Stamping Jewelry Blog: Chicago Bean Sculpture at Millenium Park - A Pendant!!! Chicago Bean Sculpture at Millenium Park - A Pendant!!! Original art jewelry by glass artist Liz Barnes. 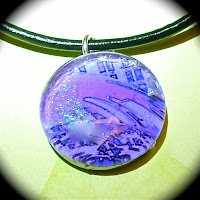 This Fused Glass cab with a sparkling dichroic moon is fused between the layers of glass. Behind the fused glass is an original photograph that my friend Matt Swain took of the cityscape of Chicago reflected in the Bean Sculpture in Millenium Park. Then I went crazy with some fun editing. I attach the glass and the photo with waterproof adhesive. It is then attached to a surgical steel pendant plate. Each pendant comes with a leather cord with a sterling silver clasp. This pendant measures 1 in diameter. ***I cut layers of glass circles, and punch out designs and then fuse these glass designs at 1450 degrees and then anneal them at 900 degrees.